So after something of a break from spending and blogging, I'm back! I'm sorry for the lack of warning but I'd like to say thank you for the continued support that has been trickling in during my absence. I hit 100 followers today and I'll take that as a hint to shut up, knuckle down and get on with the reviewing! I never really thought that I'd review many mascaras for this blog simply because I don't own or buy many! I try to stick with an everyday mascara with a good wand for defining and not too wet a formula that doesn't clump or crumble away. I use it until it runs out and then I panic. The process of buying mascaras is a painful one because apparently, finding a product that fits all of my criteria is nigh on impossible! No matter how many reviews and swatches I look at, I still feel utterly befuddled in the shops. When I bought this mascara on impulse, it was pretty out of character but I had my reasons. For starters it was the last one on the display! Despite the fact that I had read no reviews of it, I'd heard good whisperings about Maybelline mascaras in general. Priced at £6.49 (reduced from the regular price of £8.49) at Superdrug it was cheaper than the Rimmel option I was looking at and there was one glorious selling point that won me over in the end. Encased in the plastic packaging, for all the world and I to see... was the mascara wand. For me the make or break part of any mascara is the wand. While I mostly ignore adverts, claims, the names (this one especially is a mouthful) and the differences in price, I can't compromise on the wand. I'm not a fan of giant clumpy bristles and I don't think I could work with a tiny comb so it totally mystifies me as to why 90% of the products I could have bought that day didn't show me what I consider to be the main selling point! I'm highly reluctant to buy a mascara - budget or otherwise - only to open the tube and find a product I just can't work with! 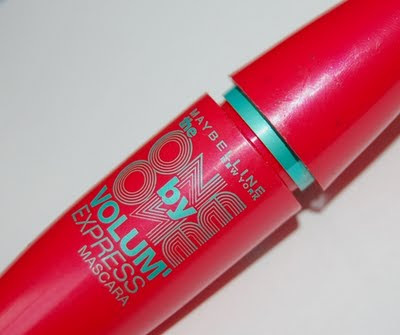 So when I looked at the Maybelline display and actually saw this wand with the rigid defining effect of a comb but the chance to get greater coverage, I handed over my cash for the snappily titled Maybelline New York the one by one volum' express mascara. Try saying that when you're tired! 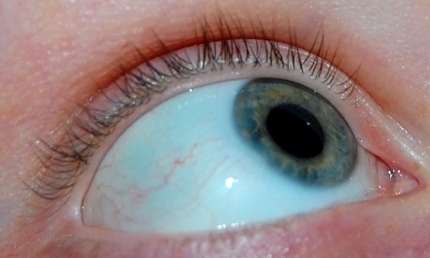 And here is my other eye with the Maybelline mascara and perhaps a little bit of undereye concealer. Now the difference is pretty impressive to me. 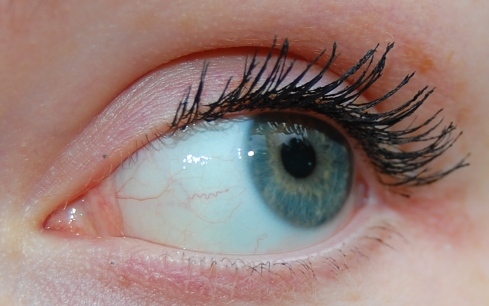 My lashes look well defined and an awful lot longer without looking spidery! The clumps I experienced with this formula were minimal although I'd definitely say that as it is new and rather wet a little goes further than I thought it would. The rigidness of the wand allows me to get the product right to the base of my lashes and comb it outwards from there. All in all I'd consider this to be money very well spent and this is now my new everyday staple. Due to the newness and the fact that very little air has reached the product, I allow my lashes a little while to dry and apply light coats rather than one heavy one just because I am that picky about clumps. I'm rather pleased with this purchase and strongly feel that other brands are missing a trick by not giving the people what they want and showing off their wands! What do you all think of the before and after here? @Pyari I'm not sure quite how many for this photo but 2-3 usually does it? I try not to put too much product on initially and work it through from my bottom lashes. It depends on each application at the moment as I'm still working my way round it but 1 heavier coat just might have a little more clumping? @G A B Y I always find that it makes it look like I have more/much thicker lashes so maybe it could be worth a shot?